Hosting a party and need a special treat? 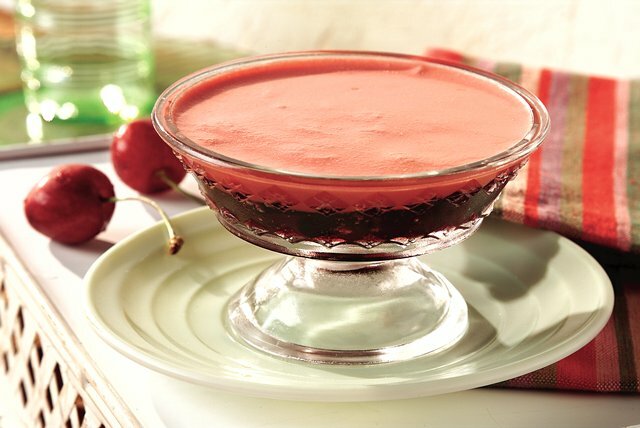 Then this Cherry Royale dessert is exactly what you're looking for to impress your guests. Drain cherries, reserving syrup. Add cold water to syrup to measure 1-1/2 cups. Cut cherries in half. Stir boiling water into gelatin in large bowl at least 2 minutes until completely dissolved. Stir in measured syrup and water. Reserve 2 cups gelatin at room temperature. Refrigerate remaining gelatin about 1 hour or until thickened (spoon drawn through leaves definite impression). Stir in cherries. Pour into 6-cup mold sprayed with cooking spray or 2-quart bowl. Refrigerate about 30 minutes or until set but not firm (should stick to finger when touched and should mound). Refrigerate reserved 2 cups gelatin 30 minutes. Stir whipped topping into 2 cups gelatin with wire whisk until smooth. Pour over gelatin layer in mold. Refrigerate 4 hours or until firm. Unmold if using mold. Store leftover gelatin mold in refrigerator. Substitute 2 pkg. (4-serving size each) JELL-O Cherry Flavor Sugar Free Gelatin for 1 pkg. (8-serving size) gelatin.